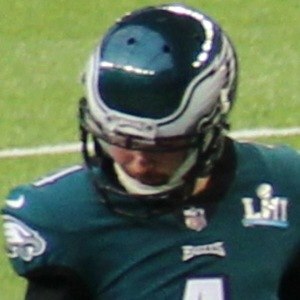 Professional football player known for playing as a Placekicker for the Philadelphia Eagles of the National Football League. He is known for having been both a Super Bowl and All American champion and has also set a variety of records for his field goals including Longest field goal by a rookie in the playoffs. He attended Lyons Township High School and went on to play college football for Memphis from 2013 until 2016. Upon graduating, he entered the NFL Draft in February of 2017. He was selected by the Cincinnati Bengals in the fifth round. In September of 2017, he was signed to the Philadelphia Eagles. He is known for having set several different records within the NFL including Longest field goal by a rookie in a Super Bowl at 46 yards along with Most 50-plus yard field goals made in a season. He was born in Western Springs, Illinois and was raised by Bruce and Diana Elliott. He played alongside Nick Foles and LeGarrette Blount as part of the Philadelphia Eagles team during Super Bowl LII.